Knowing how and when to divide perennials is key to productivity in your garden. It enables the stock to increase in numbers, both for better display and impact, and cheaply insure against loss through slugs, deer, excess wet or cold winter. And dividing will increase the vigour of the plants for better flowering. Having more enables you to repeat a plant in a border or garden plan – a keystone in garden design – making a connected theme and a more attractive display. Knowing how to divide perennials will make this easy. Faced with digging up a prized plant that is doing fine, doubts can set in. 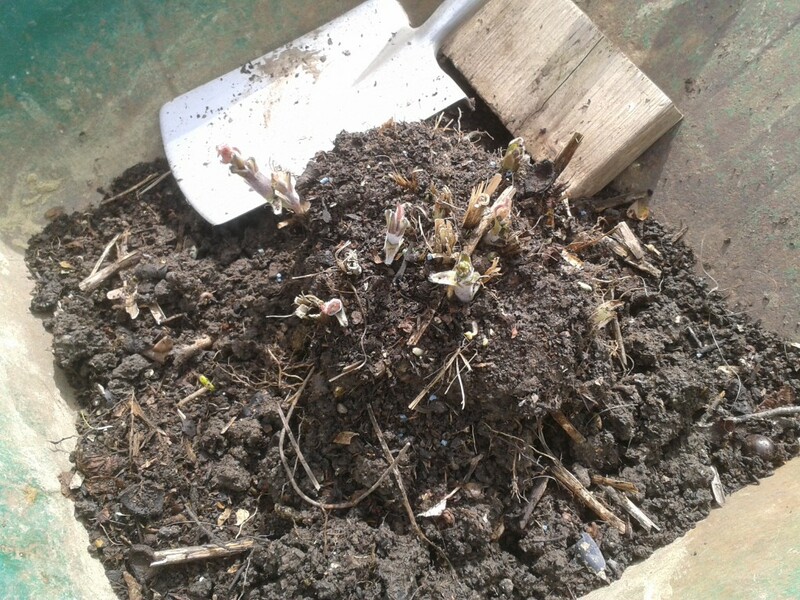 This is how I tackled one of my prize Delphiniums this week. I say “prized” because it took a long time, and probably more dead plants than I care to recall before I got Delphiniums to grow well. And they do grow very well. In fact they are virtually unstoppable. 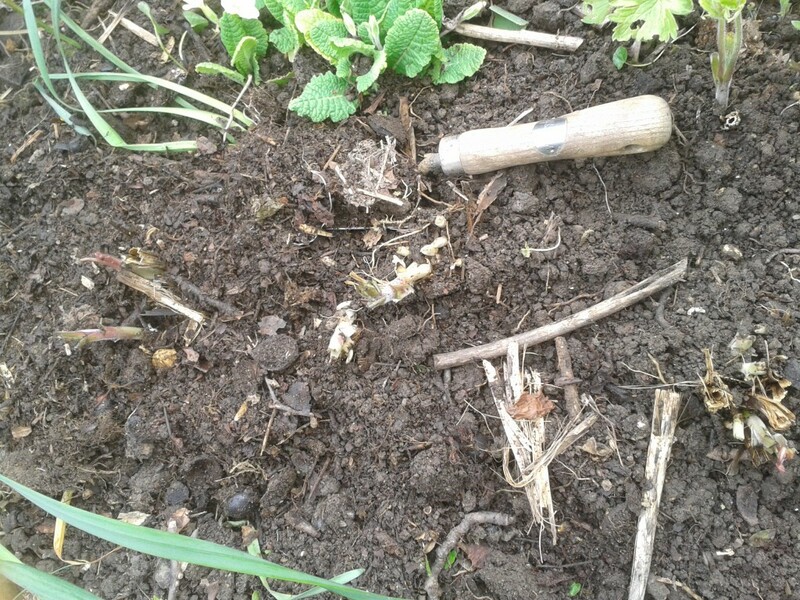 I started by digging out a clump that had about six shoots showing. It was not clear what it looked like under the soil, so I washed it off for a better look. Underneath was covered in shoots, with the strongest at the outside. I know that this plant had not been split since I planted it three years ago, so I was not sure how tough it would be. I decided to try a knife first rather than a spade, and it worked just fine. Splitting it with a carving knife was easy. 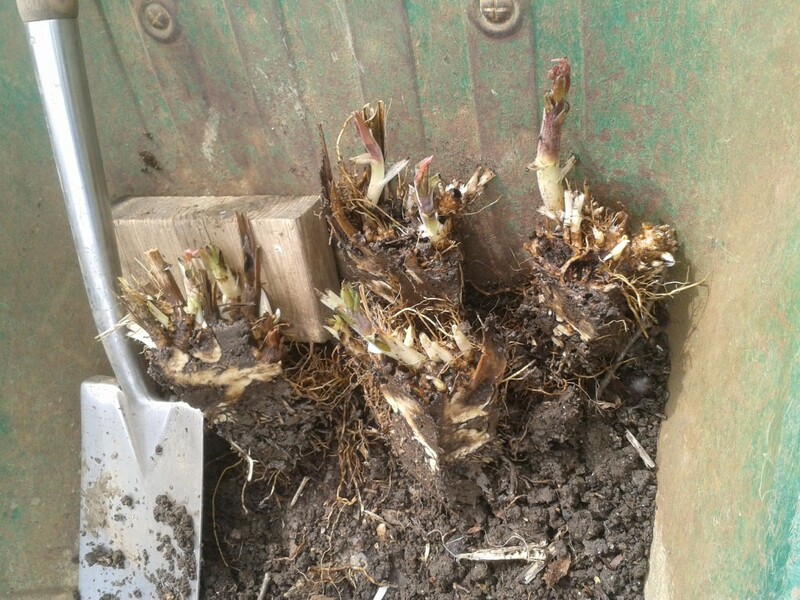 I cut it into four even pieces, each with several shoots and plenty of root. 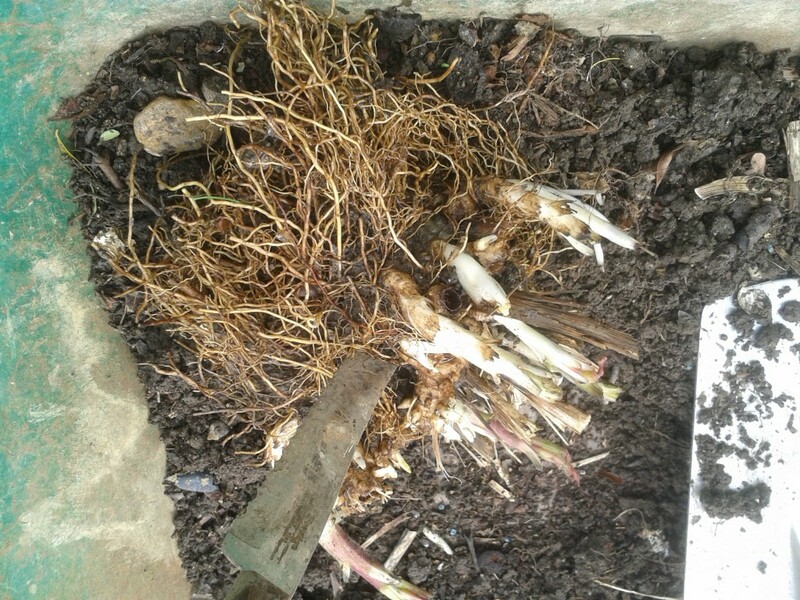 Before putting the pieces back I dug the hole deep with a fork, and put in a bucket full of rough compost. You can almost see the clay turn into perfect soil as you do it. I would say that the continual addition and digging in of compost was the most significant factor in making the clay soil here viable. 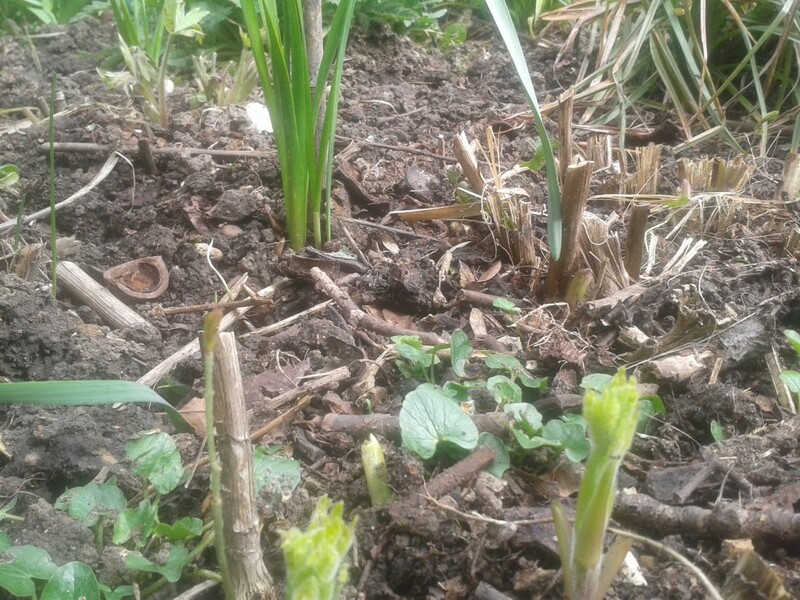 And after planting them back I gave them a light mulching of more compost, just in case we get another frost. The basic rule I apply is that if the flower in spring, wait until afterwards, otherwise spring is better than autumn. But there are exceptions. 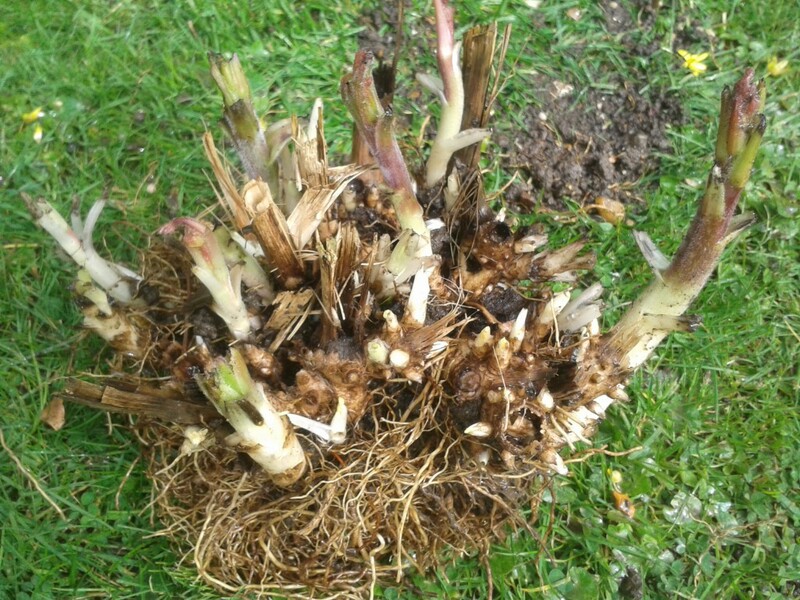 Hemerocallis is one, and Hostas too seem to perform post spring splitting. They must also be shooting. Some perennials like Helenium are still dormant in my garden. They must not have any flower spikes showing, as the Kniphofias do already. The Delphiniums here have flowered better each years since I put them in, with an earlier start and later finish – some were still flowing in December 2015. So when to divide is a judgement call. Another “rule” is to wait until after flowering, which is technically what I have done. When plants are as strong as these you can be more confident about doing it. Dividing perennials is for more more about the health of the plant than creating more. Dividing – like taking cuttings – does assure the same variety of course, where seed produces all sorts of strange versions. So combining some division, some cuttings and some seed sowing allows increasing stock, better healthier more vigorous plants, and a better display for your enjoyment.